Every year, we hear of a wedding venue or retailer go out of business. It’s inevitable in any industry. When you give someone a deposit six months to a year in advance, you really have to trust that months later they’ll still be around. But anything can happen, even to the most trusted wedding professionals: fire, hurricanes, illness or even death. How does wedding insurance protect against venue cancellations? Wedding insurance is primarily designed to protect the money you are spending on your special event should the wedding have to be postponed or canceled for a variety of reasons that are unexpected. The types of losses that are covered regarding venue cancellations range from a double booking error to the venue going bankrupt, into foreclosure or changing ownership. It would also cover if the venue was damaged by a fire or significant weather event, such as a hurricane or if repairs were not completed in time for the wedding to take place. What typical scenarios are covered by wedding insurance? Catastrophic weather is definitely one of the main reasons people elect to purchase event insurance. Most wedding insurance policies have a 14-day waiting period before coverage takes effect, so as long as the policy is issued with prior to the event date, non-refundable deposits would be covered in the event of a cancellation. Other covered types of loss would include sudden injury, illness or death of the bride, groom or their immediate family members, such as one of their parents. If one of the honorees is in the military and is unexpectedly deployed and won’t be back in time for the wedding date, policies could allow the couple to be reimbursed for deposits they would otherwise forfeit. Another type of issue that could be covered by wedding insurance is a vendor failure. Examples of this would be if the florist does not deliver all the floral arrangements that were paid for, the videographer cannot show due to the flu, or if the caterer doesn’t fulfill the contracted services. Some policies can also reimburse you for some additional costs associated with securing a new vendor if one of your contracted companies cancels at the last minute. 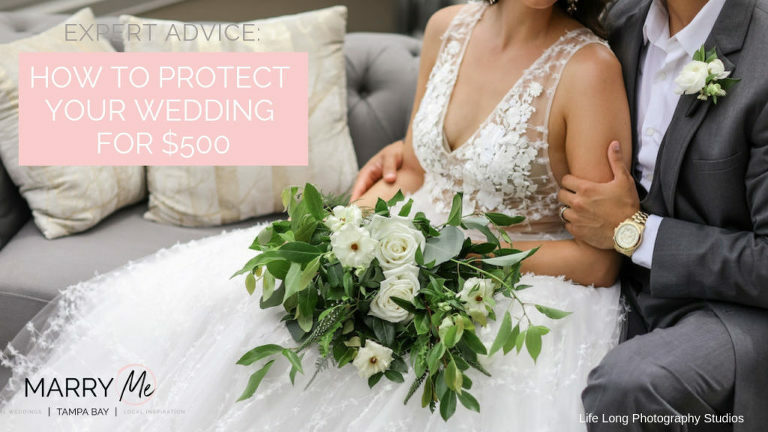 Wedding insurance often includes additional coverage such as if the wedding dress is damaged during alterations, a wedding ring goes missing before the ceremony, or loss of photos due to the photographer’s digital memory card being damaged. I want to learn more about wedding insurance from Wedding Protector Plan. Wedding Protector Plan will contact you shortly! What scenarios are not covered by wedding insurance? There are some situations that are not covered by wedding insurance, including known circumstances and change of heart coverage. Last year, a well-known bridal dress shop closed all of its stores nationwide and left many brides without wedding gowns despite the balances being fully paid. If a wedding insurance policy was purchased after this known situation, unfortunately, no coverage would be given. It is always best to purchase wedding insurance once the wedding planning begins and before any unforeseen situations pop up. If a couple decides not to get married, would they be able to use the policy to recoup the non-refundable deposits they had already paid out? Unfortunately, there would not be coverage for this situation as wedding insurance does not cover change of heart. Similarly, if a couple decided to change venues after already putting down deposits for Venue #1, they could not get coverage from the policy for those deposits and then put new deposits on Venue #2. What is the biggest mistake couples make when purchasing wedding insurance when it comes to their venue? Some couples learn about wedding insurance a few weeks prior to the wedding because their venues require liability insurance per the contract. The venue is concerned about this coverage to protect their own interests, however, the truth of the matter is that very few claims are related to liability coverage. The majority of wedding insurance claims arise out of vendor or venue issues. When couples are searching only for liability coverage, they are leaving out valuable coverage for their financial investment. Oftentimes couples do not purchase the wedding insurance early enough and do not receive the full benefit from policies. For example, if coverage was purchased within 14 days of the event, financial coverage is extremely limited. When wedding insurance is purchased within 14 days of the wedding, coverage for catastrophic weather is also eliminated. Waiting to purchase a wedding insurance policy is a mistake that prevents couples from getting the most coverage for their money. How much should couples expect to pay for wedding insurance? The cost of a wedding insurance policy depends on the amount of coverage you seek. Some venues require liability insurance so be sure to budget for that coverage as well. To insure a wedding budget of $25,000, the cost is about $255. That is only 1% of the cost for the money being spent on the wedding! Optional liability coverage will add about $165, but for less than $425, peace of mind can be established. Who wouldn’t want that during wedding planning? When should couples purchase wedding insurance? It is suggested that couples purchase wedding insurance policy when the wedding planning begins and contracts are being signed. Wedding insurance can cover deposits you have already made at the time of policy purchase (unless you already know of a loss) and money that you continue to spend going through to the event date up to the policy limits selected. Coverage can be purchased up to two years in advance of the wedding date. That sounds like a long way off, but it is not uncommon to have to pay a deposit for the weekend you want that far in advance when you are trying to book a highly sought after location. The Wedding Protector Plan hopes that your wedding day is perfect. The cost of a wedding can be considerable, and tying the knot often means being tied to specific dates and financial commitments with a variety of vendors. A wedding can be a big investment. Learn more about wedding insurance coverage and take a moment to get a quote to protect the memories that can last a lifetime.